:12 seconds left on the clock. The score was 18-20. So, an exciting twelve seconds? Not so much. Peyton Manning, the Broncos’ quarterback took a knee and let the clock run out. If you’re not a football fan, it might be hard to understand. The Broncos were in the lead. They simply ran out the clock for the win. Once they hiked the ball they didn’t have to run another play. So, Manning downed the ball immediately and the clock ran out. This is actually where both teams try to get to during the game. They want to have the lead and the ball with the ability to run out the clock without running plays. It made me think about how the game is played. In fact, how any game is played. Suppose instead of twelve seconds, the Broncos had been able to take a knee for the final minute? It’s a good move if you’re in the lead. What about five minutes? It’s impossible given the current rules of football, but suppose the rules allowed it? Would the winning team be willing to kill five minutes on the clock? The NBA shot clock was instituted to prevent just that in basketball. The worst case of a team killing the clock was November 22, 1950. The Fort Wayne Pistons beat the Minneapolis Lakers. Then final score was 19-18. The Pistons held the ball for minutes at a time. They didn’t want to play. They wanted to win. And they did. Is there a limit? 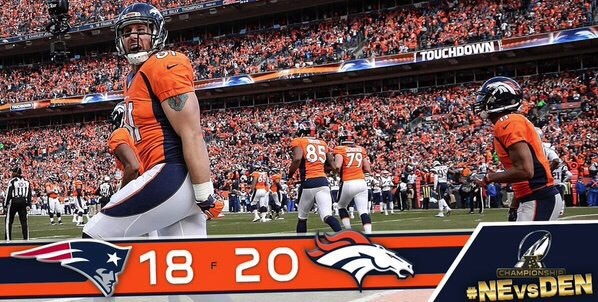 If you were a Broncos fan how much time would you be willing for your team to kill to secure a win? At the end of three quarters the Broncos were leading 17-12. If you had the ability would you have wiped out the fourth quarter? At half time it was 17-9 in favor of Denver. Given the choice would you have had them head into the locker room for half time and not come back? Even at the end of the first quarter the Broncos were up 7-6 (on a missed extra point. That IS rare.) Remember the winner goes to the Super Bowl to play for the championship. Would you skip the final 45 minutes if your team was winning after 15? I think this is part of the reason I like baseball. No matter the score, baseball plays all 27 outs. The team that is ahead by 2 runs in the 9th inning still needs to play tough defense and get the final outs. Now imagine you are one of the fans who paid hundreds of dollars for a ticket to yesterday’s game. Would you consider it worth the money if your team won but you only got to see them play one quarter of football? Don’t get me wrong. The Broncos did the right thing on Sunday. They’d played well for 59:48. Their was nothing to gain and everything to lose by running a play during that last possession. But, how often do we accept less than a complete experience to get the results we want? I have friends who are athletes. Some of my friends run ultra-marathons. They might run a 100 mile race in a day. Or, they might run a 300 mile relay race over 3 days. My friends are not the fastest athletes in their races. They don’t race for a win. They race for a finish. Finishing is a win. If you asked them if they’d prefer to simply get the t-shirt and medal without running the race, they’d think you were crazy. In fact, if you told them that they were not going to get the t-shirt or the medal, they would race anyway. If you told them that there would be no press, no one at the finish line, they’d still run. They value the experience. Think about the Patriots, the team that Denver beat yesterday. They scored a touchdown with :13 left on the clock. They tried for a 2 point conversion and missed. The onside kick was recovered by Denver. If you were a Patriots fan would you have liked to see another minute added to the clock? Just enough to get the ball back and give Tom Brady and company one more shot at the end zone? Suppose that after a minute they were still behind. Would you want them to have more time? How much? Would you like to see them continue to play until the Patriots took the lead and then end the game at that point? The game is sixty minutes long, but if your team needed 65 minutes would you change the clock? Is there a limit? An extra 5 minutes? Ten? A full quarter? You’d probably want to give your team as long as they needed to win, right? But, is that any more acceptable than shortening the game to try to preserve a win? A football game is sixty minutes long. If you could lengthen or shorten the game to help your team win, what are you winning? Is the final score with your team on top the ultimate goal? In business we see this with a temptation to bend the rules. To take advantage, if you can do it without getting caught. Or, it’s an effort to evade responsibility. I’ve worked with numerous teams where the number one goals was to avoid screwing up. They absolutely did not want to be the team that made a mistake. But, if they are never making mistakes, they aren’t really taking chances. I’m guessing that if you asked professional football players if they would rather play a single quarter and guarantee a win, or play four quarters and risk a loss, they’d opt to play the entire game. No one wants to make mistakes. My teams didn’t. But, every team makes mistakes. And a mistake is an opportunity to learn. An opportunity to identify a broken process and fix it. And when it comes down to it, your mistakes are the things that can define you. Anyone can be gracious, confident, professional when things are going smoothly. It’s when things go South that you show people the kind of person you really are. Don’t be afraid to make a mistake. Don’t cut the game short to secure a hollow victory, or add time on the clock to give you that “one more shot.” Don’t try to make mistakes , but when they happen, own them and learn from them. And go ahead and take a knee during the last twelve seconds when you have a lead. I mean, THAT is just good football.